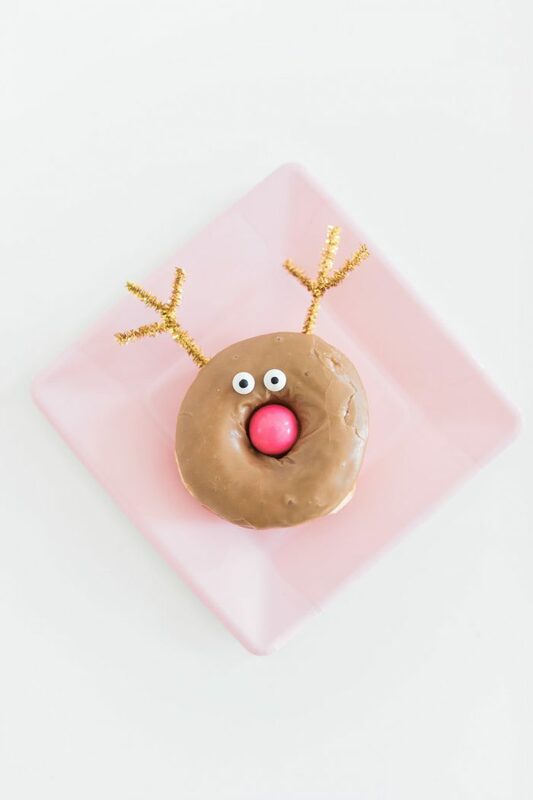 Rudolph the Pink-Nosed Reindeer donuts are officially my #1 favorite holiday project out of ALL of our content! 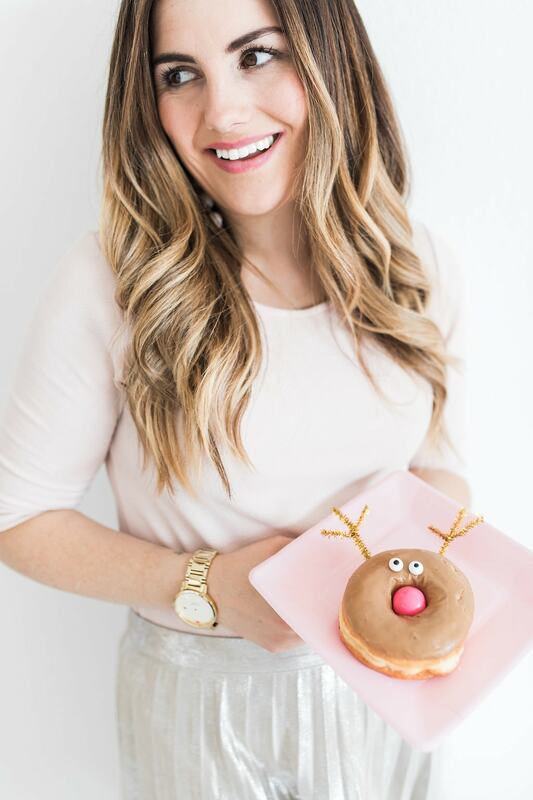 I love how these easy reindeer donuts can be dubbed as something chic for sorority parties, while playing more of a sweet vibe for children. Such a win-win! Don’t miss the tutorial video below for this fabulous Christmas dessert! 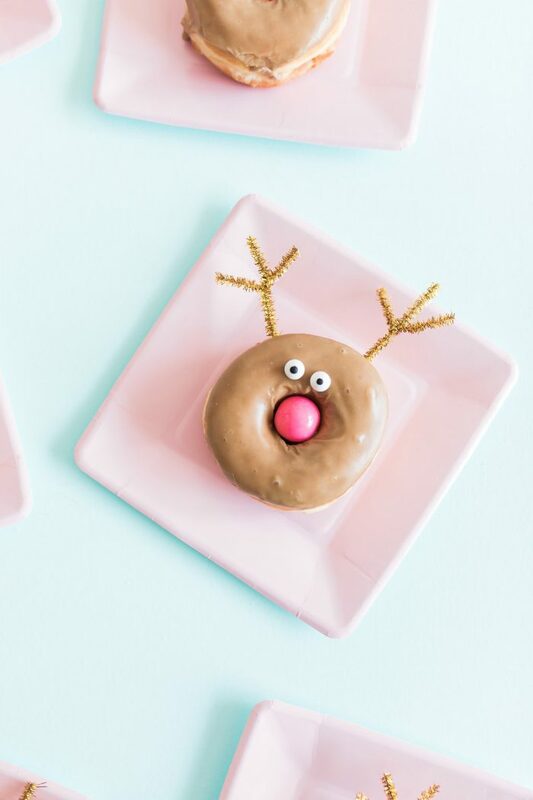 These easy DIY reindeer donuts are such a fun crafty dessert to bring to your next party. 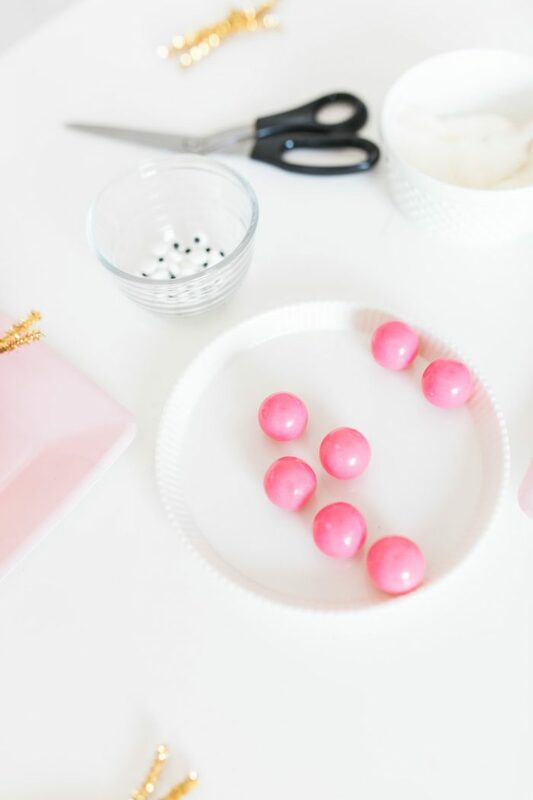 All you need to make this easy Christmas party idea is gold pipe cleaners, maple donuts, eye candies, and shimmery pink gumballs! Do you guys have any traditions or things you like to do for this time of year? We have SO MANY special family traditions that it gets a bit ridiculous! But I just LOVE adding new traditions every year! 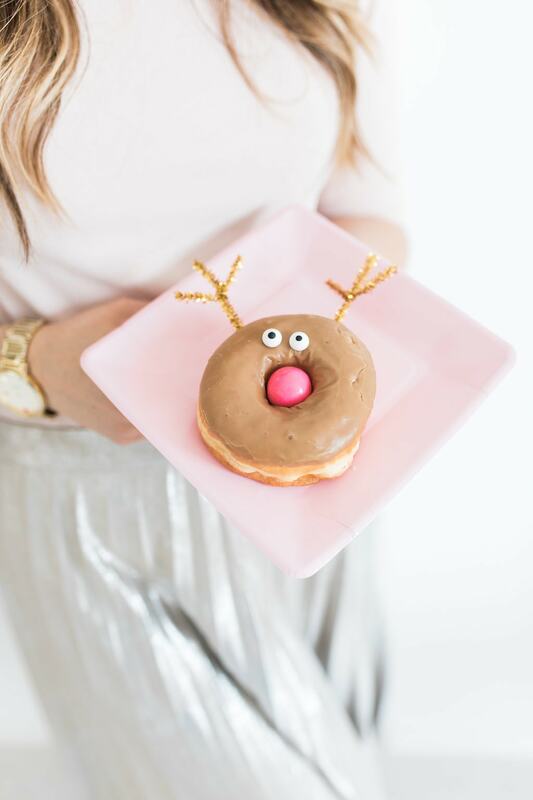 These easy reindeer donuts are definitely going on my holiday dessert baking / making list. 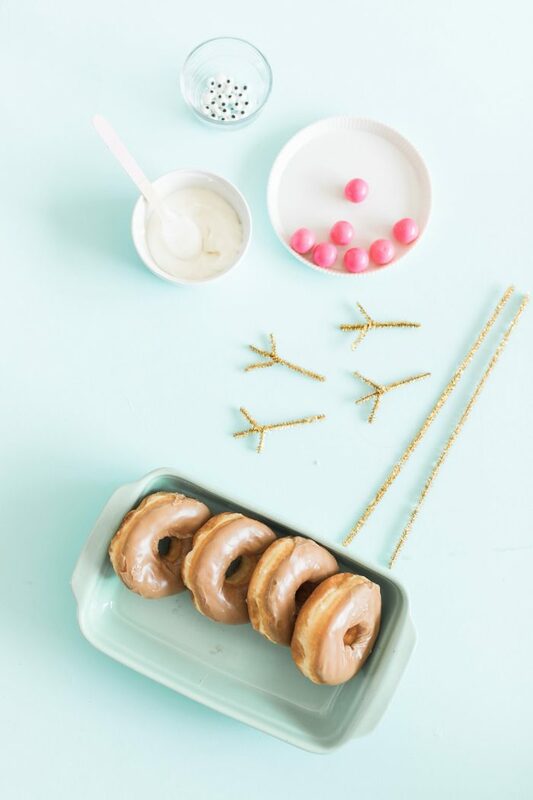 With maple donuts, gold pipe cleaners, and pink gumballs for the nose- this is totally Rudolph the Red-Nosed Reindeer’s pink nosed cousin. Did I seriously just type that?! This could also be a fun Christmas breakfast surprise. Leave it to me to do dessert for breakfast on Christmas! ;) Whether you’re eating these for breakfast or surprising the kids with some treats to take to school, these scream FUN! festive breakfast treat. We try something new every year, and I don’t think we’ve ever had the same thing twice! Even though gifts from Santa might be enough of a surprise to wake up to on Christmas morning, a cute breakfast treat just adds a little something extra. 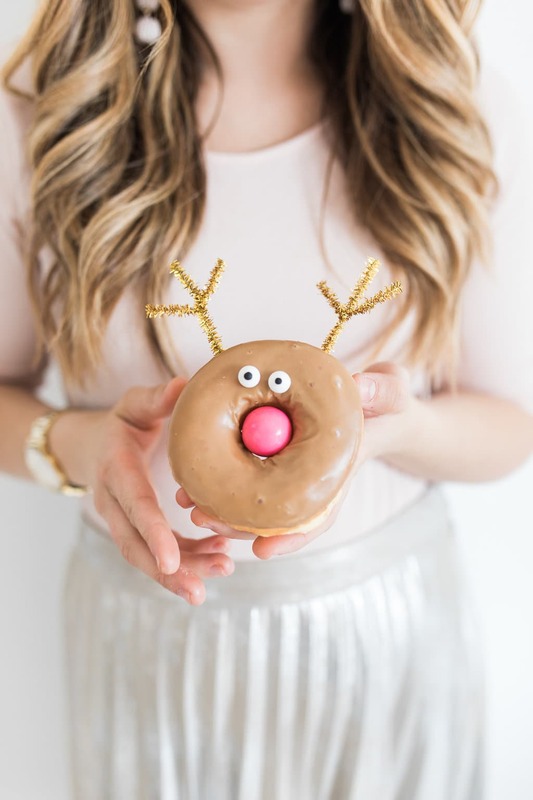 And how cute are these reindeer decorated donuts to add to the fun??! 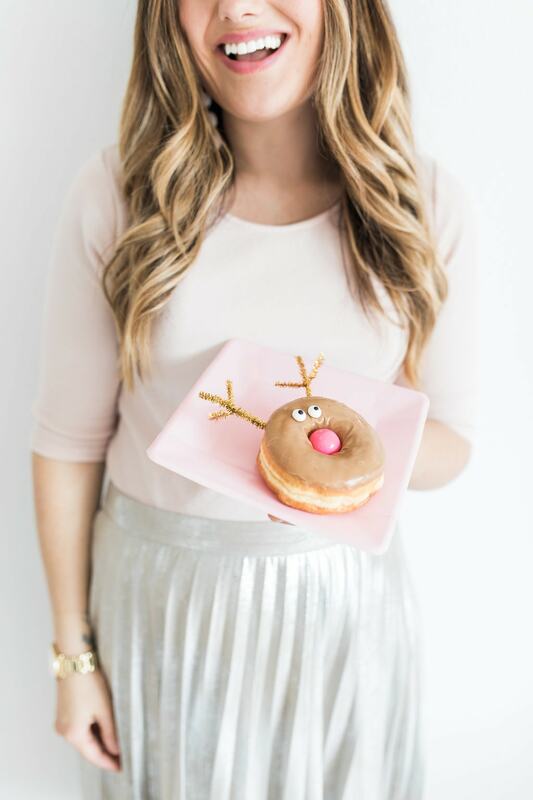 The best part about these reindeer donuts is that they are SO simple! If you’re trying to do something in the morning (especially Christmas morning), chances are, you don’t have a lot of time, which is why something like this is so great! You can easily assemble them the day-of or quickly prep them the night before. Add a few shiny decorative items to turn them into cute reindeer that are perfect for the winter day! I promise you they’re so easy to put together and they’re great for all kinds of winter holiday events – Christmas parties, winter parties, ugly Christmas sweater parties, classroom parties, and the list goes on! Try bringing them to your office Christmas party or a get-together with friends or family – they’re sure to be a delightful addition to any of your holiday festivities! Using frosting, stick on your eyes. Stick your gumball into the center of your donut. Cut and bend your pipe cleaner to make your reindeer antlers.